Marika begins to break away from her family, and Asumi works to overcome her physical limitations in Twin Spica Volume 4. 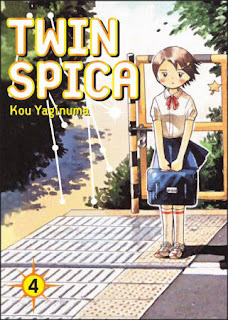 Note: Twin Spica Volume 4 is, of course, the sequel to Twin Spica Volume 3. 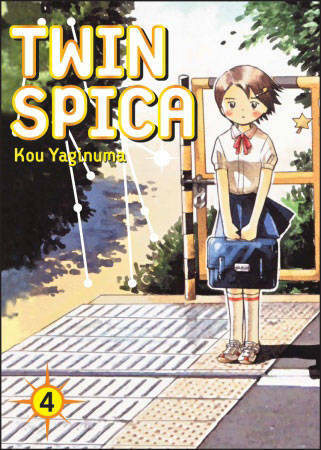 The review for Twin Spica Volume 1 is here, and the review of Twin Spica Volume 3 is here. Otherwise, read on! It's the beginning of second semester, and the new class of astronauts start running. First off is the underwater training, and Asumi is starting to realize how much of a detriment being small is. Not only is it harder for her to reach each handhold because of how short her arms are, the fall she took in Volume 3 has weakened her left hand again. Already weak from the 'Lion Incident,' now she had to work even harder to get it to where it should be. Marika is slowly continuing to come out of her shell as well. She has cut some of the ties with her family, and now lives in the same dormitory as Asumi and Ringo. She's still receiving money from her family, though, as well as some medications that she's refusing to take anymore. The small bits that we are learning about Marika's past certainly aren't comforting, though. There's a photo of what seems to be her and her father when she was younger, but the date stamp is years off of what it should be, and she seems weaker than she used to be, now that she's left her home as well. Even Lion has a bit of story to himself here. Reminiscent of the chapter 'Asumi' in Volume 1, Mr. Lion leads a man on his journey to the Sanzu River. It's hard for any child to truly relate to his parents, and even more heartbreaking when the child passes away before the parent does. Perhaps though, in this last meeting, father and son can truly let each other know how they feel about each other. More so than other volumes, this one skips around quite a bit. Occasionally, it's difficult to keep track of exactly when things are taking place. The characters continue to develop, though, and Asumi even goes on a date. It's nice to see these characters be the teenagers that they are, even as they pursue their amazing dreams. Highs: Seeing the protesters on the ferry was a rude reminder of how Japan sees the space program after the 'Lion Incident,' and that will surely come into play later on as well. Lows: The mystery surrounding Marika's origins might become more tiresome than interesting soon. Verdict: Life, and classes, go on for our students, and so far it's been a pleasure to watch.